This week's EtsyInspired shop is Putu Princess Escape. Putu Princess Escapes specializes in stencil painted shirts. They have lots of awesome Asian inspired designs. One cool thing about these shirts is that the decoration isn't just on the front. 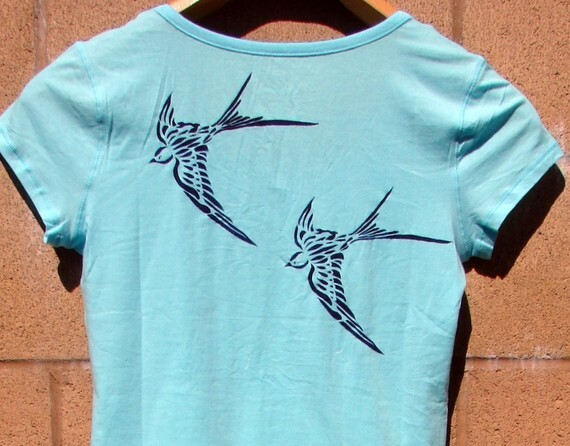 Some shirts have designs on the back and some have designs on the sleeve. They have long sleeve and short sleeve shirts. They also carry maternity shirts. This week, Putu Princess Escapes is giving away one in stock t-shirt of the winner's choice. Our sponsor this week is Some Odd Girl. You can read more about them on the EtsyInspired blog. Some Odd Girl is offering up 3 digis of the winner's choice this week as another prize. Here's my card for this week. I was inspired by the shirt featured above. I'm also entering this into a HYCCT challenge to use birds on your card and in the All Things Unity Challenge to make a monochromatic card. GORGEOUSNESS! Love the monochromatic card! The birds ROCK! Simple elegance! I love those birds...so perfect for your inspiration piece! Gorgeous CAS card, Ashley! Love thye image and you used it so fabulously!! I really really like the simplistic and monochromatic design of this card!! The bakers twine is super fab too!! LOVELY! Good luck entering it into the Unity challenge!! GREAT JOB! What a wonderful CAS card, Ashley! Love it! this is fab and perfect for the inspiration piece! What a stunning and elegant card! I love the use of the twine and those birds are just beautiful. Thanks so much for playing along with All Things Unity!! GET OUT!! Those birds are SOOOOOOOOOO awesome! 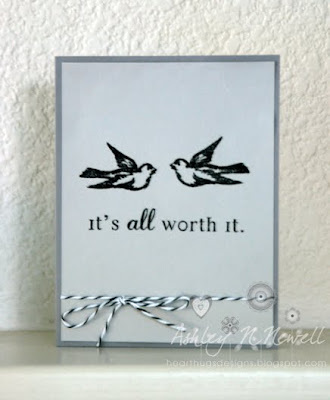 I LOVE LOVE LOVE this card--so simple and super cute! YOU ROCK! TRUTH!!! I state the TRUTH:) LOVE IT!